Cloud rings the distant summits of Skiddaw, left, and Blencathra, left. Rowling End shows in the middle distance, on the left, rising towards Causey Pike, just off the picture, and Barrow is seen behind the ridge. 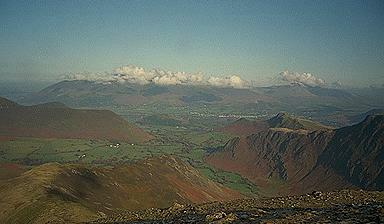 The northern ridge of Hindscarth is seen in the foreground, leading down to Scope End and the Newlands valley. The small hill at the mouth of the valley is Swinside. To the right is Maiden Moor and its spur, Knott End with Catbells beyond. Larger version of this picture.